A free education and quality education should be available to all sections of the society, rich or poor. Statements like these are often read and then forgotten the next moment. Though people are in support of it always, no one actually takes an effort to implement them. Education forms the bridge between dreams and reality. Education does not only make one literate but also aware of their surroundings. The underprivileged people should be given an opportunity of pursuing their dreams too. They are often left behind due to financial setbacks or social backgrounds. Those struck by poverty often neglects the importance of education and they believe that it is necessary for their children to work rather than study and achieve bigger. These people are in dire need of education that will enlighten them with its benefits of how it can raise up their living standards and give them a better life. We have to make them understand that they are being penny wise and pound foolish. There have been various failed attempts to provide free education to everyone but only a handful of them survive. Edupedia World is an Indian start-up that is working with the aim of creating a virtual world of free education in the absence of financial setbacks or different social backgrounds. In a world full of economists, Edupedia team believes in acquiring such assets like quality education for everyone around the globe without any costs. An effort to educate people online is the change that has occurred in the 21st century that is sure to leave a mark on many lives. Edupedia World aims at making efforts that worth towards providing quality education to everyone around the globe for free. The percentage of the total population that is left behind uneducated just because of financial problems is enormous. Our future depends on the children of today and the education which they are entitled to receive. Educating one person in turns leads to educating a family in the future prospect. People will know how quality education can transform their living standards. It benefits the children deprived of quality education as well as students are studying currently by helping them with their course study. When it comes to studying, the more you know, the more you know how less you know. No amount of study material is enough for the thirst of knowledge. 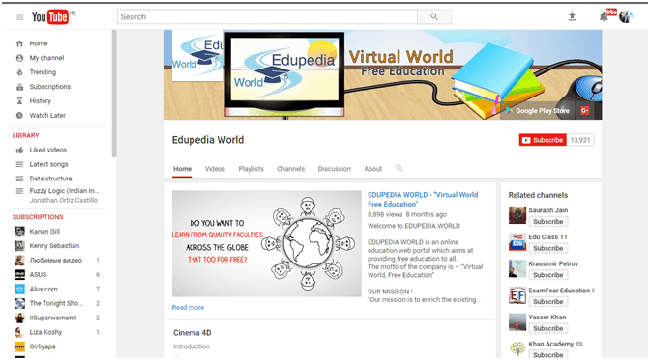 After just a year of being launched, Edupedia World has millions of views on YouTube along with thousands of subscribers. It is the largest massive open online course (MOOC) in the world. Edupedia also provides career counseling for students who are often confused about what steps have to be taken that will best suit their abilities and give them a successful career. Admission discounts for students at many business schools across India are provided to aid the students financially for higher studies. The faculty is well qualified and experienced in their respective subjects and they provide good quality study material. Also, a brief profile of every faculty is specified on the website if you want to get to know them before trusting them and their abilities. Transparency is maintained. One is always assured to get the best study material on different subjects at a single web portal. Edupedia World’s mission is to improve the existing education system by giving people across the globe access to free education just at a click. The YouTube channel is a one stop solution for study materials on various fields of education. Every video uploaded is absolutely free to watch and the study material comes from qualified professionals, so their quality is not compromised at any point of time. At Edupedia World’s YouTube channel, people have the freedom to study the field of their interest at a click sitting in their homes. What is better than being able to study in comfort your home? You get the access to various study materials that will help you to perform better academically. There are other websites available that let you study from qualified teachers, but everything at a cost. 1. How to Crack GRE/SAT/TOEFL Examinations With PrepEd? Here at Edupedia World you are ensured of it being free of cost. Learning from YouTube videos at the channel gives the students flexibility. There is no strict deadlines or pressure to complete the course in a specified period. People have the freedom to choose their own study hours and subjects. In the current scenario, where everything is getting modernized, education should not fall behind.